The design of an office can affect worker productivity and mood. This is especially true in a call center environment where the furniture design can layout can help to create a working environment conducive to the employer’s business goals. Designing furniture pieces and layout for the space plus around the needs of your business, you can improve employee comfort, promote interconnectedness between workers, and make the office an all around better place to be. Here are some of the best ways to design call center furniture for productivity. Having ergonomic accessories in the office is a must. When employees are sitting at their desks all day and making fairly repetitive motions, the design of a workspace can help them relive body fatigue. Having chairs, desks, and monitors be adjustable to the individual is a great place to start. When employees are more comfortable throughout the day, they can focus more of their energy on doing the work at hand. Many employers say that one of their biggest costs is the expense of training new employees due to high turnover. Ergonomic work stations help cut down on employee turnover, which means that over time the new accessories can pay for themselves. The visibility of employees and supervisors creates a productive work space encouraging communication and allowing employees to easily seek help when they need it. When the supervisor’s desk is at standing height, monitoring is much easier. Other design features that promote employee connectedness include grouping employees by team and incorporating white boards or tack boards by each employee group. Finally, having glass partitions or an open layout in the office helps everyone to remain visible and allows the work process to become transparent. These solutions are simple to apply in the work space, and they can help to improve productivity and communication. 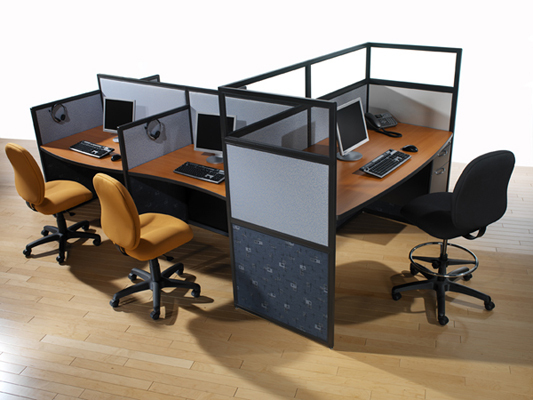 Interior Concepts is an excellent choice for your call center furniture needs. Rather than simply selling our products and services, we provide value by knowing what’s needed in today’s market. Our specialization in call center furniture design and industry knowledge can help you have the best office layout possible. Our experienced sales managers can help design the furniture for your office so that it fits your needs and the needs of your employees. In short, there are plenty of things that you can do to improve the flow and productivity of your office, and we are your first resource in applying the concepts and getting the most out of your call center furniture. Take a look at our slideshow for some inspiration for your call center layouts. To share or email this slideshow click the Share button in the upper right corner of the presentation. Interior Concepts can assist you in designing your call center. We offer free space planning services with your furniture quote to create the best layout for your office. Give us a call 800-678-5550 to get started with one of our call center design experts.